During the 1790s Joseph Mallord William Turner (1775 – 1851), arguably the greatest British artist of all time, visited a number of Pembrokeshire locations during his summer tours of the UK. 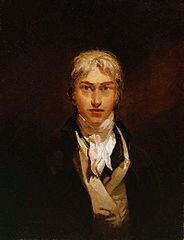 Turner travelled extensively, first of all just within the UK, but later, after the Napoleonic Wars ended, he was able to travel to Europe as well. He would sketch prolifically during his summer travels and then work on painting in watercolour or oil from those sketches during the winter. His first independent tour, at the age of seventeen in 1792, included Wales and he visited again in 1795. Turner’s sketchbooks from the time include scenes at Tenby, Carew, St Davids, Milford Haven, St Bride’s Bay and Pembroke amongst many other places throughout Wales. Always a controversial figure, during his lifetime Turner was lauded as the artist who could most “stirringly and truthfully measure the moods of nature” but some of his works were nonetheless vilified as “crude blotches”. He is often referred to nowadays as “the painter of light”.